With this year’s expiration of the Kyoto Protocol and our Climate Action Plan (CAP) tax, the City of Boulder is looking to the future, trying to come up with an appropriate longer term climate action framework, and the necessary funding to support it. To this end there’s going to be a measure on the ballot this fall to extend the CAP tax. I’m glad that we’re talking about this within the city (and county), because at the state and national level, the issue seems to have faded into the background. Unfortunately, that doesn’t mean the problem has gone away. 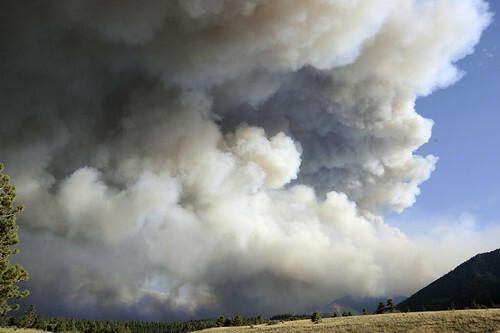 This year’s wildfires, the continuing drought that’s decimating the corn and soybean harvests, and the phenomenal 2012 arctic melt season are just appetizers. 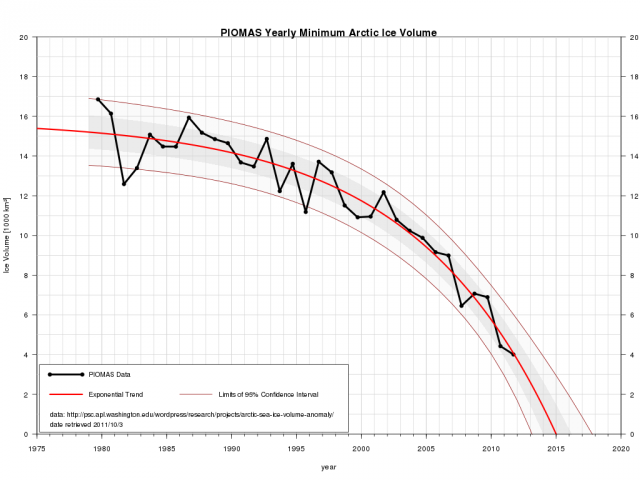 If the last decade’s trend holds true, we’ll have an ice-free arctic ocean some September between 2015 and 2020. The major sources of emissions, broadly, are electricity generation, transportation, the built environment (space heating, cooling, hot water, lighting), agriculture, and industry (the embodied energy of all the stuff we buy, use, and then frequently discard). The extent to which local government can impact these areas varies. We interface with embodied energy most directly when it comes to disposal and at that point, the materials have already been made. Similarly, most of our food comes from outside the region. Our most ambitious project so far has been the exploration of creating a low-carbon municipal utility. We’ve also potentially got significant leverage when it comes to transportation, land use, and the built environment, since cities and counties are largely responsible for regulating those domains in the US. The goal that’s currently being considered is “climate neutrality” by 2050. That is essentially a goal of zero, 38 years hence. Exactly how we’d be measuring that is yet to be determined, but broadly speaking this is the right goal. It’s a goal that’s been set by the atmosphere and the sun. It’s a goal which, if adopted globally, would likely keep us under 450ppm CO2, and that would probably keep the extent of warming to less than 2°C (3.6°F). Whether that amount of warming is really acceptable is yet to be seen, but it’s surely more acceptable than the default option, which is to burn every last scrap of carbon we can get our greedy little opposable thumbs on, taking atmospheric CO2 to 1000ppm or more and then, you know… waiting to see what happens. Yeeehaw! With the climate action framework we have a broader challenge that’s similar in many ways to the formation of a low-carbon municipal utility. We know it would be technically feasible with unlimited funds, but the effort probably won’t have much of an impact on the world if we can’t show that it can also be done cost-effectively, with low risk, and the ability to scale up beyond our community. Scalability is subtle, but key. For example, wind power is cheap today. Late last year wind bids in Michigan were coming in without tax breaks at $61/MWh (see this PDF), which is the same price as Xcel listed in its 2011 resource plan (Vol. 1 p1-34, Fig. 1.5-1) for the cheapest new generation option — low efficiency natural gas combustion turbines. However, building ourselves a giant wind farm that generates on average the same amount of electricity as we use on an annual basis doesn’t scale up to a larger zero-carbon system, because the wind is intermittent, and when it’s not blowing we’d need to use coal or gas fired power (at least until someone gets massive, cost-effective electricity storage figured out). By all indications a scalable solution will include both solar and wind (because they have different production curves), good energy efficiency measures, demand side management, and some form of dispatchable power to fill in the gaps — probably gas in the short run, hopefully electrical storage in the longer run. But there’s a larger scalability issue we need to address, intrinsic to the migration away from mining fossil fuels accumulated over hundreds of millions of years and toward harvesting current renewable energy fluxes. In sunny, windy, sparsely populated Colorado, it’s potentially possible to swap out our existing power system for renewables. In places with less abundant wind and solar resources and/or much higher population densities, the diffuse nature of renewable power fluxes makes very high levels of energy consumption impossible to support. David MacKay lays out this fact very clearly in his book Sustainable Energy — Without the Hot Air which I just reviewed here. (You can also watch him give a talk at Harvard on YouTube if you don’t want to dive into the book just yet. Saul Griffith has a slightly more polemic take on the same situation. Vaclav Smil addresses many of the same issues in Energy at the Crossroads. None of this is news.). Thus, the civilization we’re trying to build is one that provides a high quality of life while using a small amount of power. We must reduce our energy intensity and change our energy sources. Both are necessary, neither one alone is sufficient. In the creation of a low or zero carbon electrical utility, there’s some risk; it’s not something that’s been done at scale anywhere in the world. I believe it’s a calculated risk that’s probably worth taking. In contrast, with transportation and land use, as well as building energy efficiency, local government can take great strides toward deploying zero emissions systems with very little risk because other cities and nations have already done the research and development for us. In some cases, these systems have already been deployed. There’s no question whether it can be done, nor about how to do it. There is simply a question of political will. Do we want to do it, or not? For transportation and land use, the urban forms used in the days of yore function just fine today. There are plenty of smaller cities in northern Europe where most trips taken by most people are done on foot, by bike, or with public transit. These cities have not banned cars, they don’t have any skyscraper canyons, and the energy they expend on giving people access to the things they want is vastly less than it is here. They have modest density and good design that prioritizes the convenience, safety, and experience of people over automobiles, as Danish architect Jan Gehl has passionately argued should be the norm in his book Cities for People. If you don’t have the time, inclination, or carbon offsets to visit these cities, at least spend some time taking a walking tour of them with Google Street View before you dismiss this idea out of hand. These cities feel good. Münster, Germany (pop. 280,000) and Freiburg, Germany (pop. 224,000) are also good, but they don’t have Google Street View enabled. Obviously our city doesn’t look like that now, but that doesn’t mean it couldn’t look a lot more like that in 2050. However, current zoning, parking, and road engineering regulations won’t let that transformation happen. Because they de-emphasize cars, these cities are safer, quieter, and cleaner than their North American counterparts. Their economies are less susceptible to increases in oil prices. Their inhabitants, owing to a very modest amount of daily physical activity, are much healthier and in better spirits. Cities like this regularly place near the top of world livability indices. And if you still look at them and think to yourself “I would never want to live somewhere like that” then at least pause and consider whether you (or your kids, or grandkids depending on your age) would prefer to live somewhere like that, or in a suburban landscape embedded within a world that’s been ravaged by climate change. A six degree world. Is an American development pattern spawned by post-WWII GI mortgage financing and the temporary abundance of cheap liquid hydrocarbons really that intrinsically preferable? Or is it just what we happen to be used to here, now? Unlike the urban forms above, comfortable, near-climate neutral buildings that most people would like to live in are relatively new, but they’ve already been deployed en masse in Europe. The German Passivhaus standard was developed in the early 1990s, and uses 90% less energy than the existing building stock on space conditioning, and 75% less energy than buildings built to current standards. They do this by being nearly airtight, super insulated, and relying mostly on modest solar gains and the heat generated by residents and their appliances. A sample of 250 dwelling units meeting the standard was built all across Europe to measure its performance in a variety of climates and demonstrate that it could be met cost-effectively (see the CEPHEUS final report, as a PDF). As a result, in Sweden a comparable standard has been adopted nationwide as their building code. Tens of thousands of buildings meeting this standard or others equivalent to it (such as the Swiss MINERGIE-P) have been built across northern Europe. Many cities (and the entire German state of Bavaria) now require that all public buildings meet these standards. With the super-efficient building market coming up to scale, these buildings are now regularly built for less than a 10% capital cost premium. The UK has committed to all new residential units being zero-carbon by 2016, with all new buildings following suit by 2019. Those are not distant, aspirational goals. 2016 is the next election cycle. It’s approximately now. Approximately zero, approximately now. That’s what we should be aiming for in new construction. It’s technically feasible, and need not be prohibitively expensive once the market is at scale, and no longer a niche for custom design-build firms. Actually getting to zero across the whole of our existing building stock may well take until 2050, and will mean a lot of very deep retrofits. Especially for small scale residential and commercial buildings, these retrofits can be both technically challenging and costly. We should avoid creating future retrofit projects by building as efficiently as we can today. Passivhaus buildings are retrofit proof from an energy standpoint. They’re good enough to let us meet the goal of climate neutrality. 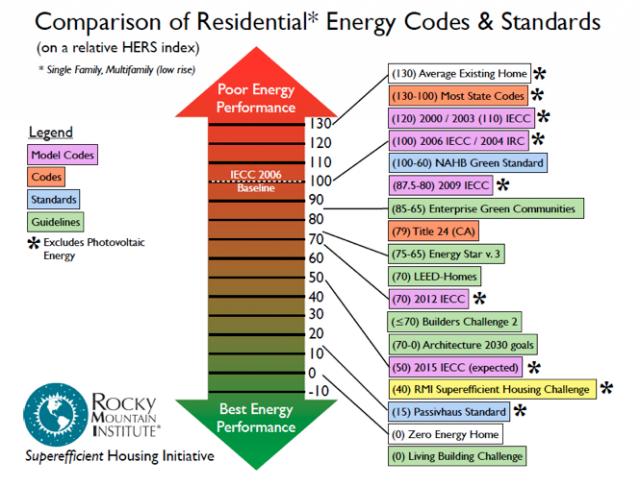 If we take the 2006 International Energy Conservation Code (IECC) that we’re currently enforcing as a baseline that uses 100 units of energy, then the 2012 IECC that we’re talking about adopting as of next year uses about 70, and the 2015 IECC that’s currently in development will probably be about 50 (see the DOE’s analysis of the cost effectiveness of the 2006 vs. 2012 codes in this PDF). These are substantial, but still incremental improvements. In contrast, Swedish building code, Passivhaus, and the Swiss MINERGIE-P all use only 10-20% as much energy as our current code (i.e. they use 80-90% less energy). We know what the goal looks like, we know it can be attained now, and so we should map out a crash course to normalizing it, as RMI’s architect James Brew outlines in this post. I like Passivhaus because it’s simple and performance based, instead of being prescriptive, but I’m not necessarily arguing for this particular standard in all its details. What I’m saying is this level of performance is available today, and being deployed in other jurisdictions that take climate and energy issues seriously. If we purport to take these issues seriously as well, then we should at least consider taking on this level of performance as a near-term goal. Sweden, Germany, Denmark, Austria and Switzerland have a head start. Our position is more like that of the UK — we care, but we’re late to the game — and so perhaps we should look at their schedule as a model for our own: new residential units zero carbon by 2016, and all new buildings zero carbon by say 2020. If we’re not going to put ourselves in that cohort, we should make that decision actively, and lay out the reasoning behind it. We can’t simply claim it’s not possible or prohibitively expensive, because entire nations are already doing it. So far, high performance buildings in the US have been more expensive than in Europe, but this is partly because very few builders have deep experience with them, and partly because many of the high performance components either aren’t available here, or are only imported piecemeal. Highly insulating “super-windows” that can be tuned to either admit or prevent solar heat gain are a prerequisite. High efficiency heat recovering ventilation (HRV) systems are too. Many European super-low-energy buildings integrate a bunch of heat-management functions into a single appliance. They recover heat from ventilation exhaust, provide domestic hot water, and potentially integrate a high efficiency ground or air source heat pump to provide whatever small amount of additional heating or cooling is required. Many of the most cost-effective passive buildings are factory built — prefabricated to exacting standards in a controlled environment, instead of being assembled on-site from individual components as is common practice in much of the world. If we can’t attain something akin to the Passivhaus standard today because of these market barriers, then what can we do to help the industry overcome them in the next decade? We’ve already got a lot of high performance building knowledge locally with NREL’s Buildings division in Golden, the Colorado Green Building Guild, and of course the Rocky Mountain Institute, which just coordinated a deep energy retrofit of the Empire State Building, and also evaluated the effectiveness of Boulder’s Climate Action Plan so far. We have established manufacturers like SeriousWindows that would be happy to compete aggressively in a North American Passive House market, were it to become substantial. We have startups like Coolerado, whose indirect evaporative cooling systems have just reduced the energy consumption of the National Snow and Ice Data Center by a whopping 85% (more than paying for the upgrade with energy savings within 3 years). Could we help kickstart local manufacturing of high efficiency HRVs or heat pumps by guaranteeing a substantial local market? Might Boulder County become a hub for high quality, high efficiency modular and custom prefabricated buildings? If you think that any substantial portion of North American cities are going to even attempt to meet the climate challenge, then these are all growth industries that we would be well advised to foster locally. Nothing I’ve discussed above is pie-in-the-sky. It doesn’t depend on technological breakthroughs. It’s all on the table today if we want to go for it. Changing our urban form over the next 40 years would involve (gasp!) some change in the way we experience our daily lives. Anyone over the age of 50 will no doubt recall that our daily lives have also changed over the past 40 years. Technology has changed us. Half a century of government mandates to build sprawl have changed us. Over the next 40 years, there’s every indication that the climate will change us, and drastically, if we don’t get our butts in gear. Technology will in all likelihood march on. The discussion we need to have is about what kind of change we want to embrace, not whether things are going to change. There are some absolutely wonderful futures available to us today, at rock bottom prices. We should pick one and go for it, because this is a limited time offer. Operators are standing by. This post originally appeared at Amateur Earthling. The Urbanophile | What Is a City For? Great article, Zane. Reading this, I was thinking about the disconnect between representations of idyllic living in popular culture (movies, paintings, etc), and the places where we actually live. 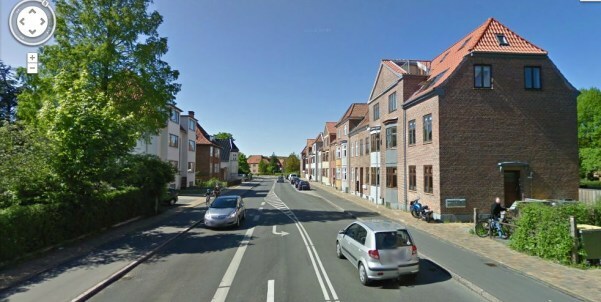 If pop culture wants to show a friendly, homey neighborhood, it will often show European-style urban design as found in the cities you reference. If it wants to show a barren, stifling environment, it will show typical suburban development. Yet America keeps building, and a huge proportion of Americans live in, typical suburban development. Your focus is largely on new construction. But mainly we should be thinking about how to improve the built environment we already have. That includes retrofitting existing buildings for energy efficiency while retaining their character and embodied energy; encouraging accessory units either as separate carriage-house-style buildings or as part of existing single-family houses; breaking up larger blocks with paths or alleys to enhance walkability; relaxing use rules so as to put retail and offices in closer proximity to homes; and so on. Retrofits of our existing building stock is absolutely vital, but my understanding is that it’s significantly more difficult and costly than building right the first time around. Short of encasing the entire building in spray-foam insulation, getting super tight building envelopes after the fact is challenging. It would be interesting to see the expected building stock turnover between now and 2050, and the relative cost effectiveness of various retrofit vs. new-construction strategies. It might be the case (though I don’t know) that for some buildings it’s worth replacing them entirely, in the same way it’s worth replacing incandescent bulbs with CFLs or LEDs, even if the old bulb hasn’t burned out yet. The Swiss 2000 Watt society project is a great resource for extreme, society-wide energy reduction, and it has looked at retrofits in their pilot regions I think… Basel, Zürich. See this White Paper: http://www.novatlantis.ch/fileadmin/downloads/2000watt/Weissbuch.pdf (Section 4.1). Obviously their building stock is very different from ours, but the same methodology can be applied here. Their focus is still largely on technological fixes, but not entirely.